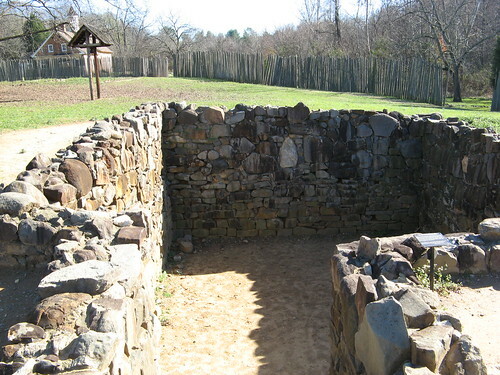 The first settlement of present-day Winston-Salem began in an abandoned trapper’s cabin 20 years before the American Revolution at the site of Historic Bethabara Park, which commemorates the Bethabara settlement of 1753. 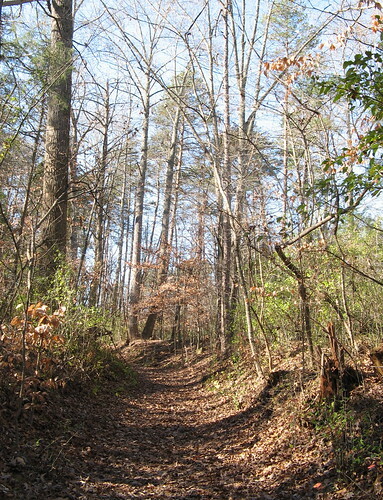 Most of the park is populated with the foundations of old buildings or modern-day reproductions, but it also has at least four miles of nature trails that are well worth a visit in fall and winter. The trails are mostly flat and partly paved; my favorite section uses floating boardwalks to traverse the edge of a marsh — things get interesting when the boards sink below water level as you walk on them. The settlers were German Christian missionaries commonly called “the Moravians” because most of the original members of the sect came from Moravia, a region near Bohemia (now Czechoslovakia). While most Americans have heard of the Quakers and the Puritans, few know much about the Moravians, a major historical injustice: Moravians were the first Protestants, a century before Martin Luther. How far ahead of their time were they? Well, the man credited with inspiring the creation of their religion was declared a heretic by the Catholic church and burned at the stake in 1415. Three hundred years later, a German noble granted sanctuary to a collection of Moravian believers, who started sending missionaries around the globe a few decades later. 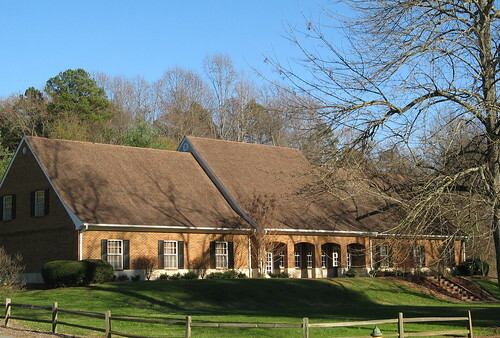 The first Moravians in North America established Pennsylvania settlements at Bethlehem and Nazareth in the early 1700s, but felt they needed some breathing room and bought nearly 100,000 acres (most of present-day Forsyth County) from a British aristocrat. 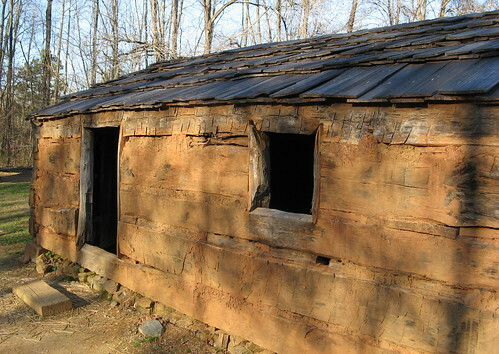 In 1753, at least 15 men walked from Pennsylvania to their new land and set up shop at Bethabara, working as carpenters, millers, potters and other craftsmen. Bethabara was never intended to be a permanent settlement — that was to be set up later when they found a more suitable site. In 1766, the Moravians started building the town of Salem, which merged with nearby Winston early in the 20th century. Just for the record, Melissa’s mom works at Old Salem, the city’s major tourist destination. It’s sort of a scaled-down version of Colonial Williamsburg, with interpreters in period clothing demonstrating how the Moravians lived, worked and prayed. Bethabara has government subsides so there’s no admission fee; Old Salem has an entrance fee, but it’s a far more elaborate tourist experience. OK, let’s look at some pictures. 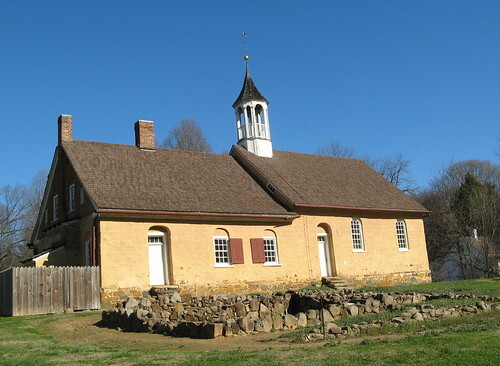 The Geimenhaus, a combined church and residence built in 1788, is the oldest large building at Bethabara, which became a farm to serve the growing population of Salem. Over the years most of the original buildings fell into disrepair; today some of the foundations have been restored. 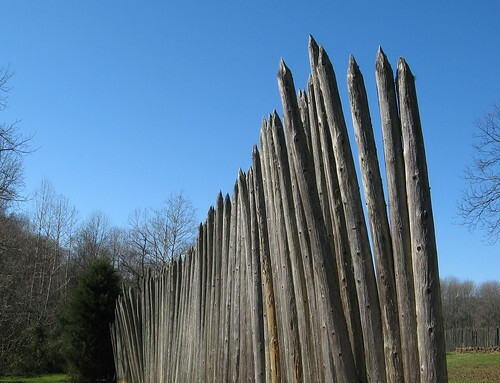 The settlers built a wall to protect against the potential of Indian attacks during the French-Indian War; no attacks ever materialized, as luck would have it. Here’s the foundation of one of the original buildings. They didn’t build McMansions in those days. The Bethabara Greenway passes through the park and extends to the marsh area west of the settlement. It’s about a mile and a third of flat hiking; much it is paved, unlike this dirt-path section. You’ll want to grab a map at the visitors center before you set out — the trail network is not that complicated, but it’s much easier to navigate with the map (which also has detailed turn-by-turn directions on the back side). 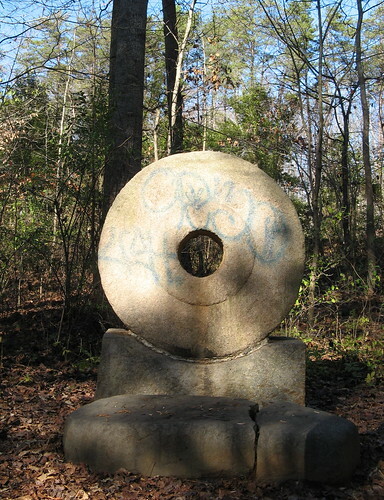 Industrious miscreants thoughtfully decorated this 250-year-old millstone. 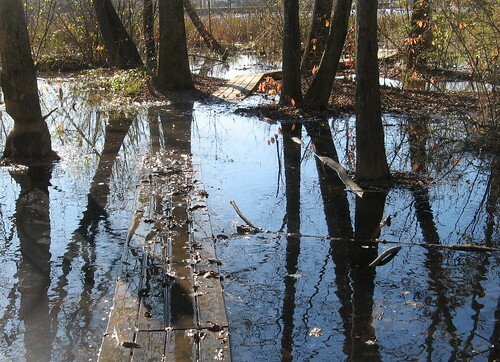 Here’s the boardwalk at the Marsh — a great place to test hiking boot manufacturers’ claims of waterproofness. 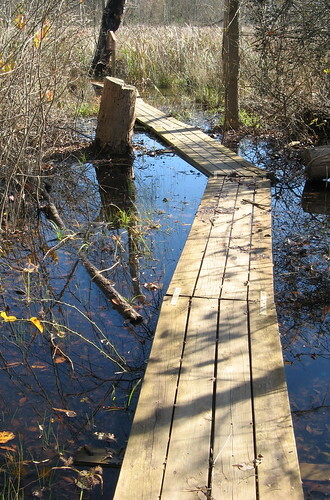 Looking back on submerged boardwalk after I had passed through. 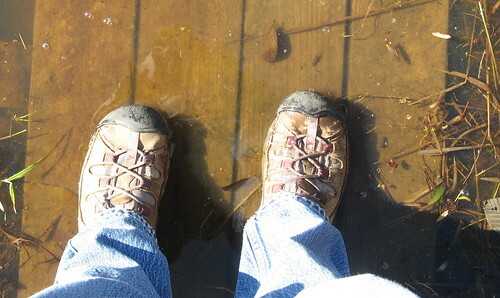 The boards don’t sink very far — the water didn’t go over the ankles of my hiking boots, for instance. Not knowing the boards’ stability made it a bit of an adventure. Here’s a good look at the marshland. 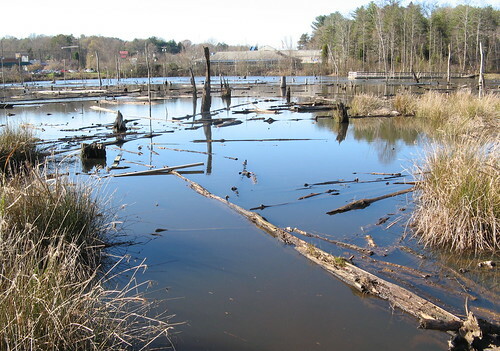 Interestingly, I didn’t see any waterfowl, perhaps because this section of North Carolina is not on one of the major “flyways” used by migratory birds. Speaking of wildlife, I imagine this area is snake heaven in summer and spring; if you’re phobic you might want to keep that in mind. 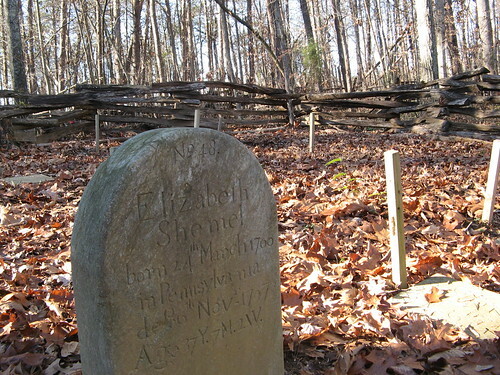 Here’s the “Visitors’ Graveyard” on the return half of the hike. This is a replica of a structure where sick visitors were housed — a room on either side served as a kind of quarantine. 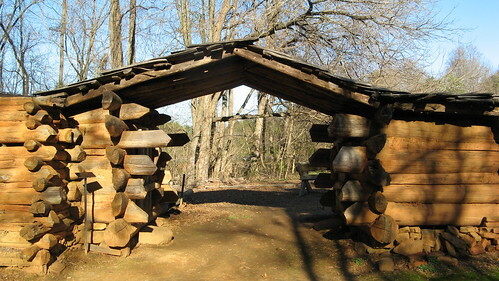 Replica of the abandoned cabin where the original settlers stayed. My mother-in-law tells me it got so cold one night that the men brought in a horse and huddled around it for warmth. 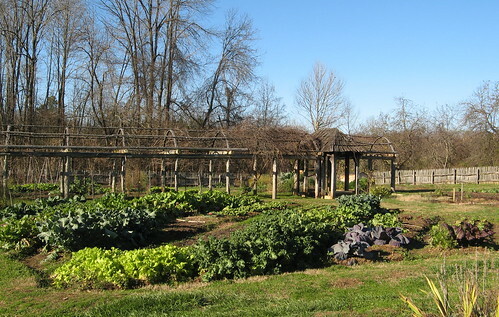 Garden reflects the Moravians’ reputation for medicinal herbs. The visitors center. Maps available in back outside the door. 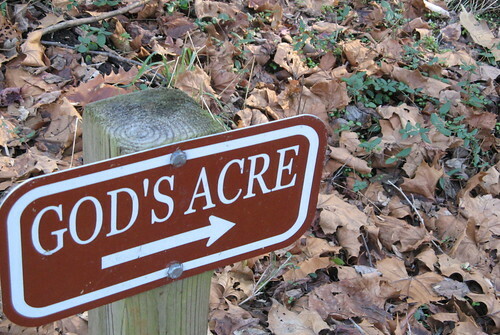 God’s Acre is a cemetery at the top of a hill near here. Not much of a climb. 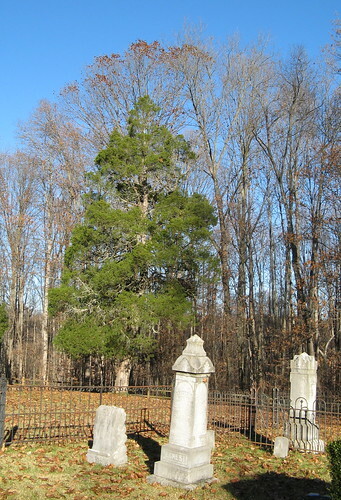 Scene from the cemetery on the hilltop. Many of the stones date to the mid-1700s. OK, enough history for one weekend. Note the park district’s posted hours of operation for the park apply only to the visitors’ center. The trails are open all the time.